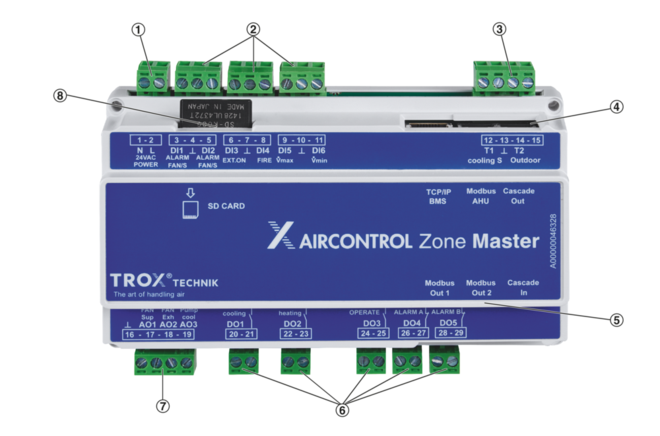 The X-AIR-ZMAS zone master module is used for the integration and configuration of up to 25 zone modules; 25 zone modules and the zone master module form a segment. The zone master module includes a webserver. The webserver is used to access a web browser (e.g. Internet Explorer or Mozilla Firefox) for the configuration display and operation of the zone master. 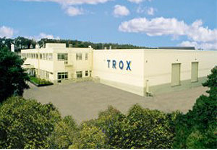 Interfaces to higher-level systems and to an air handling unit are used for exchanging data with those systems. The zone master module has inputs and outputs for the integration of components that are relevant to the entire segment. Up to five cascading master modules form a section with up to 125 zone modules. The first master module in such a chain is the highest-level master, with higher-level functions. This highest-level master performs functions for the entire section, such as controlling the fans and releasing heating and cooling requests. All other functions of the zone master module apply only to the respective segment. Outdoor air temperature sensor: Summer or winter compensation for all zone modules is based on the outdoor air temperature. 2 relays, NO, 5 A, 230 V max. 3 relays, 1x NO, 2x NC, 5 A, 30 V max. 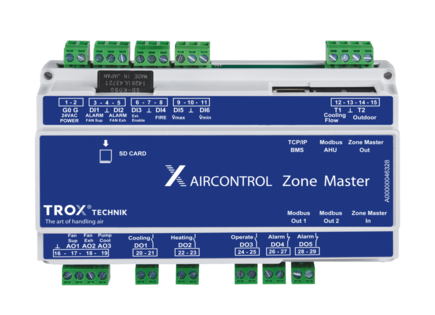 X-AIRCONTROL zone master module, for the control of zone modules and as an interface to higher-level systems. Centralised parameter setting, operation and monitoring of zone modules in decentralised control systems. 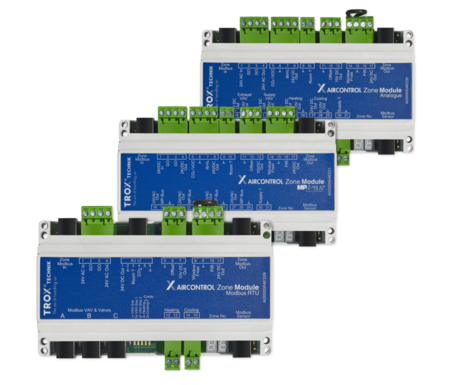 The zone master modules expand the functions of the control system such that any energy savings potential can be fully used; they also improve safety and comfort in the zones. One zone master module and up to 25 zone modules form a segment. Up to five cascading master modules form a section with up to 125 zone modules. Communication between master modules, and between master and zone modules, is by plug and play. Web server for configuration and status display; user interface optimised also for mobile devices. Modbus TCP and BACnet IP interfaces to higher-level systems. Module suitable for installation in switch cabinets (on a mounting rail) or for installation on the face of walls or ceilings. 1 interface to the central BMS: Ethernet TCP/IP, 10/100 Mbit/s, 100 m max. 1 interface to an air handling unit: Modbus RTU, for RJ12 plug (6P6C), 100 m max. Increasing requirements on the energy efficiency of ventilation and air conditioning systems as well as EU regulations can be fulfilled with intelligent control engineering solutions. 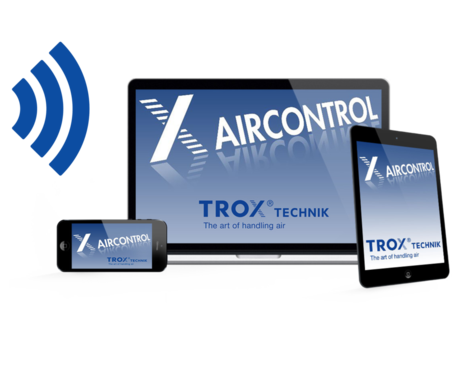 X-AIRCONTROL is a control system that uses information from sensors and actuating elements to optimise ventilation and air conditioning systems. It calculates what all is required to achieve a comfortable room climate, and controls fans, pumps and valves accordingly. X-AIRCONTROL is a modular system that can be used to optimise individual functions or a whole range of functions for a project. An X-AIRCONTROL zone is an area where air conditioning parameters such as temperature and humidity are controlled based on demand and based on the occupancy. These are usually single rooms, but it is possible to create individual zones also in larger areas, e.g. in open plan offices. A segment is a group of up to 25 zone modules; the entire segment is controlled as a unit, i.e. the same conditions apply to the entire segment. Grouping zones into segments is necessary when these zones are to be controlled centrally and when data from these zones are to be evaluated. A segment may be a floor in a building, the wing of a building or simply areas that are used differently from adjacent areas. A segment is controlled by a zone master module. A section is a group of up to 5 segments. A section may consist of up to 5 zone master modules and 125 zone modules. A single zone module and a room control panel can be used to control a single room. Use additional sensors (optional) to include other parameters. Up to 25 zone modules and another 4 zone master modules can be connected to a zone master module such that a system of up to 125 zones is achieved. Different zone modules (Modbus, MP bus or Analogue) can be combined and connected with plug and play. Each zone module controls and maintains individually the required conditions for the particular zone (single room) for which it is used. The zone modules are connected in series; 100 m cables (module to module) allow for linking even large areas or different buildings. Each zone master module and each zone module is automatically assigned a unique address (plug and play), which simplifies commissioning. If a project is to include X-CUBE compact air handling units, zone control with X-AIRCONTROL is the ideal system solution. With such a solution the air handling unit's X-CUBE Control system not only activates fans, dampers and other components of the air handling unit, it also acts as the zone master. The X-CUBE compact air handling unit can serve up to four zones. If up to four zone modules are connected to the X-CUBE compact, no additional zone master module is required. 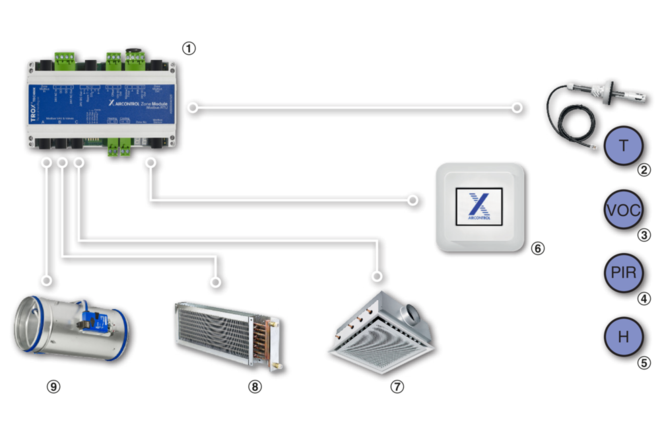 X-CUBE Control includes an Ethernet interface and a webserver for the configuration of the air handling unit, yet it can also be used to configure the connected zone modules. X-CUBE air handling units with X-CUBE Control offer zone master functions; no additional units or devices are necessary. If X-CUBE Control is to be used for the zone master function, all entries, both for the X-CUBE and for the zone modules, have to be made on the X-CUBE Control touch screen. This includes configuration, display of the system configuration, monitoring, and alarm management. Since X-CUBE Control includes an integral webserver, the system can be accessed from anywhere with the correct password.